The city of Mannheim is located in the southwestern region of Germany and is home to over 300,000 citizens. In 1607, it was officially designated as a city by the Elector Frederick IV, so as I write this review, Mannheim is celebrating its 400th birthday. Whenever I see a recording in which the conductor's name is preceded by "Dr.," I also suspect that the name is pseudonym. Once again, however, Dr. Hans Wolf was a real person, and he died as recently as 2005. He served as Livingston's "musical director," and ReDiscovery's brief notes also inform us that he conducted at the Seattle Opera very late in his life. His performance of Haydn's "Military" Symphony is delightful, steering a middle course between Romantic excess and the severity one sometimes gets with today's authentic performance practices. One doesn't have to make excuses for this "Military"'s presence! Joseph Rosenstock (1895-1985) was similarly long-lived. ReDiscovery tells us that he was born in Kraków, studied in Vienna, and worked in opera houses in Darmstadt, Stuttgart, and Mannheim until he was forced out by the Nazis. From there, he went to Japan (! ), and then, after the war, to New York City, where he became associated with both the New York City Opera and the Metropolitan Opera. I wonder what it was like for Rosenstock to return to Mannheim in the 1950s? Rosenstock doesn't elicit such polished playing from the Orchestra – not compared to Wolf, anyway. The violins can sound thin and scratchy, particularly in Beethoven's Leonore Overture #3. 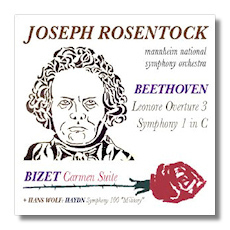 Still, Rosenstock and the Orchestra build up a good head of steam in the overture, and so Beethoven is well served. The performance of the symphony, while not at all objectionable, is not unusual or remarkable in any way. (It seems that this was the first stereophonic recording of the work.) Collectors of phonographic arcana – and I guess I have to include myself among them – will appreciate it regardless. An added incentive toward purchasing this CD-R is the sound. ReDiscovery had access to the reel tape masters for all of these recordings, and the wide-ranging stereo sound hardly shows its age. In fact, it compares favorably to many a more recent recording, even if the channel separation is perhaps a bit exaggerated. David Gideon's digital remastering is excellent. ReDiscovery CD-Rs are available from www.rediscovery.us for $15, which includes shipping and handling. All things considered, this is an enjoyable reissue.